Give your windows a gorgeous makeover with our photo blinds. Available in either stiff translucent fabric or blackout fabric, you can make your own blinds to complement your home décor or to use in your bedroom for a better night's sleep. Lovingly handmade to order in London, UK and custom printed with your photos, designs or artwork which you can preview in real time using our intuitive design tool. Choose your own custom sizes up to either 300 cm x 135 cm, or 135 cm x 300 cm (for the Stiff Translucent) and 300 x 500 cm or 500 cm x 300 cm (for the Blackout) making your photo blinds ideal for any number of end uses, from living rooms and dining rooms to offices and stores. With a choice of two types of blind, personalise your room on a whole new level. 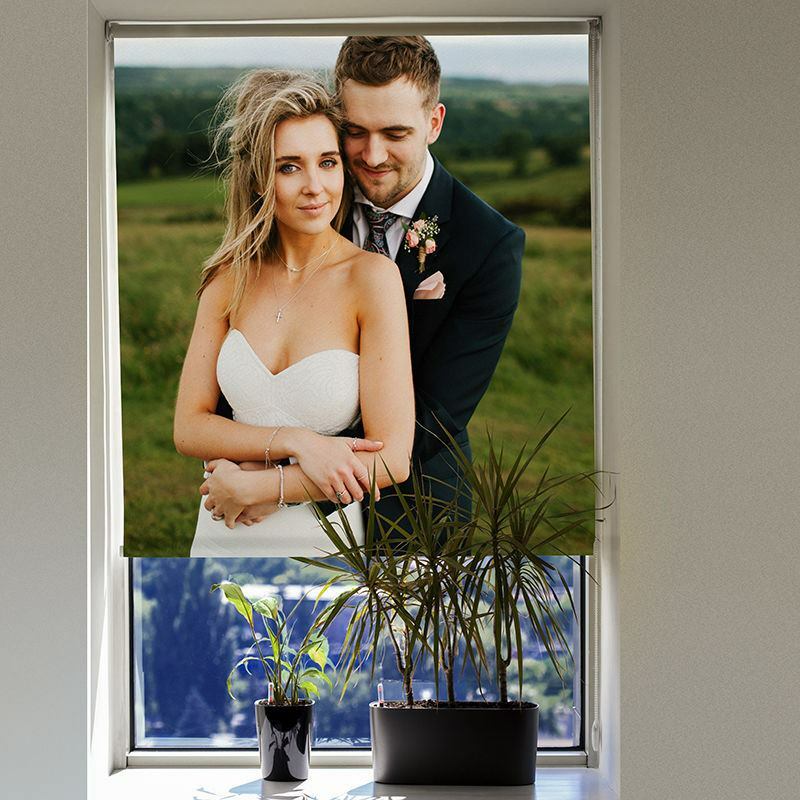 Blackout or stiff translucent roller blinds, personalised with your photos and images are a fantastic way to add a personal touch to your home decor. Made to measure for a perfect fit, from a fire retardant, non-fray material and full instructions supplied, these blinds are ideal for anywhere in your home. Our bespoke blinds are fantastic. The whole process from start to finish was so easy. We picked our subject, filled in the details and within days we were putting up our new blinds. They are such great quality, everyone of ours friends that have seen them, are jealous and they all want to know where they can get some made. Really helpful customer service, quality product & prompt delivery. Amazing Quality/but for old customer must be arrange Discount/????? Our photo blinds look amazing and really add a touch of elegance to the home. To get the best results and ensure your blinds are designed and installed to perfection, follow our instructions and read our Safety & Fitting guide. Please also read our Safety Cord Control information below for how to safely use your blinds. If all care and installation instructions followed correctly, photo blinds have a Three-year guarantee on print, material & mechanism. Measuring the dimensions is crucial to a successful custom roller blind installation. First, you need to decide how you want to mount your roller blinds - see the options below. Once you've decided, you then need to input the width and height dimensions as specified for each mounting style. Relief: add 5cm to the width. Recess: provide the exact dimensions. Input these figures into the design tool to start creating your own blinds. This is where the blind screws to the window frame or wall and stands proud of the wall or frame. You must add at least 5cm in width to house the spindle fittings as well as the personalised blind. The blind goes inside the 'box' of the window. We need to know the precise dimensions. We subtract 3.2cm from the fabric width to allow for brackets. The finished blind including brackets will equal your selected width. We have 2 fabrics for our personalised roller blinds, both providing a completely different look, feel and even purpose. Our Stiff Translucent fabric is decorative, textured and lets some light shine through without being transparent at all. These are perfect for conservatories when you want the hue of the sunshine but without it glaring into your face. You cannot see through the Stiff Translucent material, but some light shines through. Our Blackout fabric does what it says on the tin; blocks out all light, making them the ideal blinds for babies nurseries, bedrooms and even cinema rooms. This material also has waterproof qualities so they work well in bathrooms and as kitchen roller blinds UK. You really do get to customise every aspect of your bespoke roller blinds. For the cord, first, choose which side you'd like it on. This could depend on whether you're right or left handed, or where the blinds are to be fitted and which side has the easiest access. Secondly, choose your cord style. It comes as standard in white plastic, or for an extra cost, give your blinds a stylish silver metallic cord. Now it's the fun part. You can choose a single image, background colours, text overlays or create a photo collage using your favourite family snaps. Simply select more than one photo, choose your preferred style from our ready-made collages or move the images yourself for a custom made collage. Use our zoom and preview functionality to double check your design and ensure it's exactly the way you want it. Whilst we will contact you regarding low-quality images, any spellings or positioning of images is not up to us to rectify should there be an error. All roller blinds have a cord control that can give rise to safety concerns with children. Please keep the cord out of reach of children by fitting and using the cord clip supplied. How to attach the cord clip: Take each part of the clear plastic clip and line up the last 'ball' on the ends of the cord string. Press the 'ball' into the holes so you hear a 'click'. To fix the 2 ends together, slot the 2 clips into one another as if you were making a full square. (Push it against your finger for support.) You should hear a clear 'snap'. How it works: If a child, or anyone, pulls too hard on the cord, the clip will come apart. This is to protect children who can accidentally get cords wrapped around their neck. To avoid this happening when you open or shut your blinds, pull the cord gently, guiding it along with your hands. Please keep cords out of the reach of young children particularly towards toddlers 18 - 36 months especially in bedrooms. See below for the child safety regulations in regards to roller blind cords. For extra precaution, even with a safety device in place, we recommend that you move furniture such as cots, beds, side chairs away from windows fitted with a roller blind that has a side cord control mechanism. A safety breaker piece will be supplied, with any blind with cords and/or chains. We advise the recommended distance from the floor to the bottom of the chain will be at least 80cm. We supply the cord length at 2/3rds the length of your chosen drop. A warning notice comes attached to your roller blind. Installation instructions will be provided and must be available once the blind has been fitted. There will be a warning notice on the product packaging. Our company name and date of manufacture are included on the roller blind fabric. These safety measures will be applied to every blind supplied by Contrado Imaging Ltd. Please note: Both fabrics are fire retardant, and safe for use in homes. Please note: The total thickness of your photo blind, once fully rolled (including the pole) is between 5.5 - 6cm. We advise to check the measurements of your window frame, and the distance between the frame and the ceiling, to ensure the window opens properly, without the blinds obstructing them. Please note: We will add a few rolls to the top of your blind by mirroring your image, ensuring that the colours match up. This will stop the pole being displayed when your blind is fully closed. You need to ensure that you do not pull the blind further than the lower limit. Feel free to contact the customer service team for more information about your wholesale discount. If you created already a basket, even better. You can save your basket and we can double check with your basket ID, how your discount would look like. Your blinds are made to order and made to measure as well. Using specialist eco-friendly inks our technicians fuse your design to the fibres deep in the fabric, creating a long-lasting print which has vivid colour, with intricate detailing. We add two to three wraps of extra fabric at the top of your image. We mirror your design in most cases, so when the blind is fully extended the metal pole is not exposed. Make sure you do not extend the roller blind past the lower limit of your window as this may cause the fabric to fall off in years to come. If you select blackout material, the reverse is white in colour. Bringing the ocean beachfront to you is possible when you make your own blinds. Printed with a gorgeous image of the sea and blue skies, your blinds will make every day feel like you're on holiday. Combine education with decoration and print an old style vintage map onto your small roller blinds. When you're washing up at the sink you can plan your next trip, or lie in bed dreaming of lands far away. Design kids roller blinds for their bedrooms using pictures of their favourite cartoon, hobby or animal. The blackout fabric would be a good choice so they can get a better night's sleep and won't complain when it's too light for bedtime in the summer. Design custom made roller blinds for your business using your business logo and adding text to display your company name, and even contact details. A great way to advertise yourself at the same time as stopping those peeping Toms looking through your windows when you're closed. Custom folding Screen in two three or four panels. Design with photos and or text for your own room dividers. Shower curtains custom printed and made to order with your photos, design or text in 3 sizes. Design one online in our system. Luxury Suede Vision curtains made in bespoke sizes for any window. Choice of headings and linings to suit any needs.